REally like your Blog on GE and I enjoy the articles, but it would be helpful to note if products are PC, Mac or Linux compatible. RoboGEO is a great program but NOT Mac friendly. Do you know of a similar program for the Mac? Speaking about "geotagging": do you know locr? locr offers the ideal solution and makes geotagging exceptionally easy. 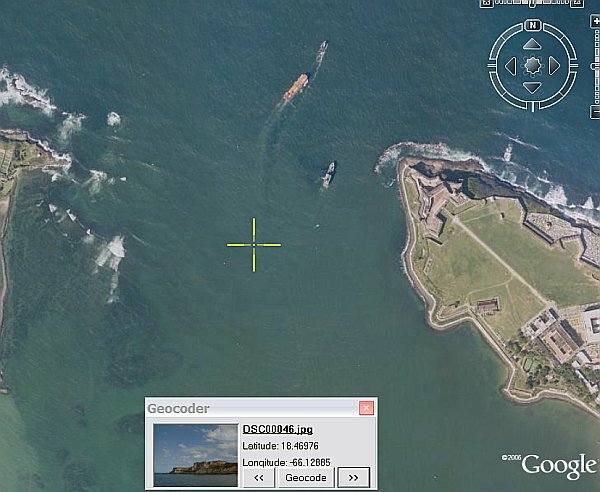 locr uses GoogleMaps with detailed maps and high-resolution satellite images. To geotag your photos just enter address, let locr search, fine-tune the marker, accept position, and done! If you don't know the exact address simply use drag&drop to set the position. For automatic geotagging you need a datalog GPS receiver in additon to your digital camera. The GPS receiver data and the digital camera data is then automatically linked together by the locr software. All information will be written into the EXIF header. Use the "Show in Google Earth" button to view your photos in Google Earth. With locr you can upload photos with GPS information in them without any further settings. In the standard view, locr shows the photo itself, plus the place it was taken. If you want to know more about the place where the photo was taken, just have at look at the Wikipedia articles which are also automatically assigned to the picture. Have a look at www.locr.com.